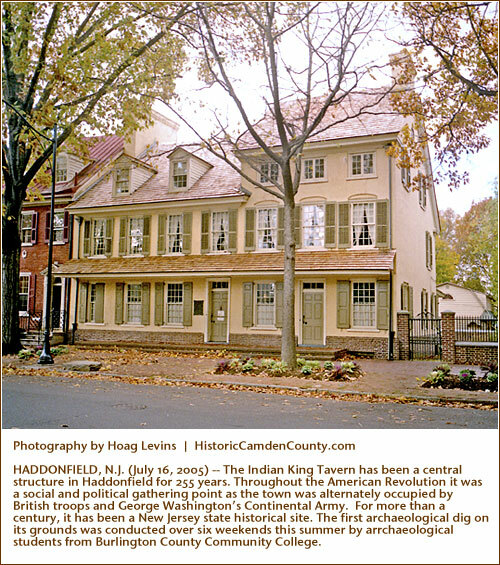 HADDONFIELD, N.J. -- The 255-year-old Indian King Tavern has been a central feature of downtown Haddonfield since well before the American Revolution. 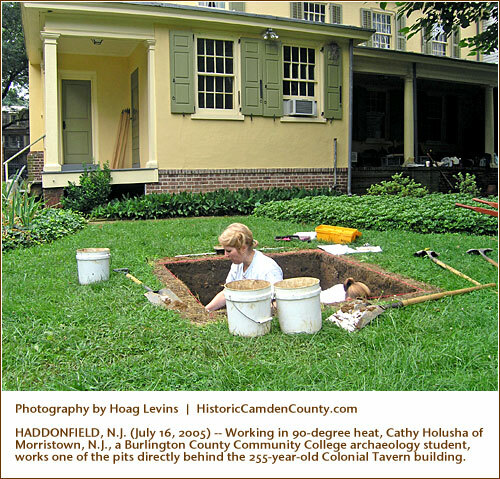 The first archaeological exploration of its grounds took place this summer as students from a Burlington County Community College archaeology class spent six weekends excavating the rear yard of the state historic site. 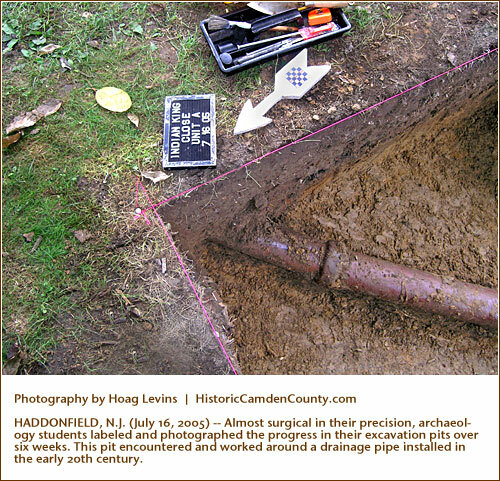 Headed by Steven Hardegen, senior adjunct professor of archaeology at BCCC, the crew dug a string of small shovel test pits around the grounds and then opened two larger square pits. 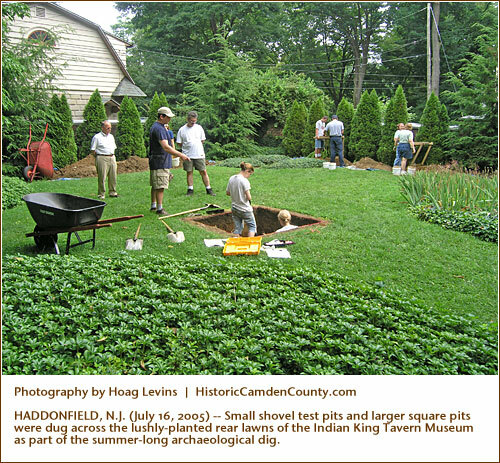 Dug inches at a time with with hand trowels, the pits cut down through centuries of human history. Above, right, BCCC student Denise Papp of Browns Mills points out a large piece of pottery. Almost surgical in their precision, students labeled and photographed the progress in their excavation pits over six weeks. This pit, above, left, encountered and worked around a drainage pipe installed in the early 20th century. 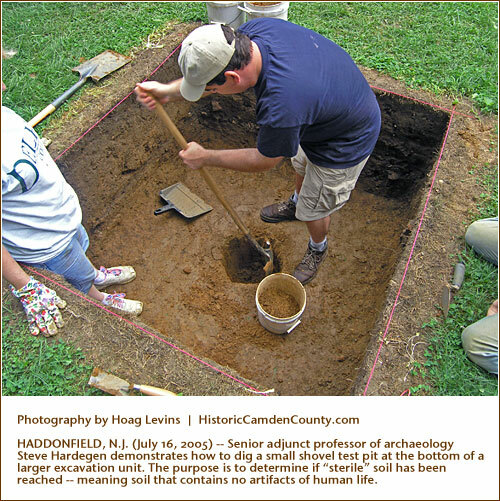 Above, right, Steve Hardegen digs a shovel test pit at the bottom of a large pit or "excavation unit." All dirt coming from the pits was processed through screens to sieve out artifacts. 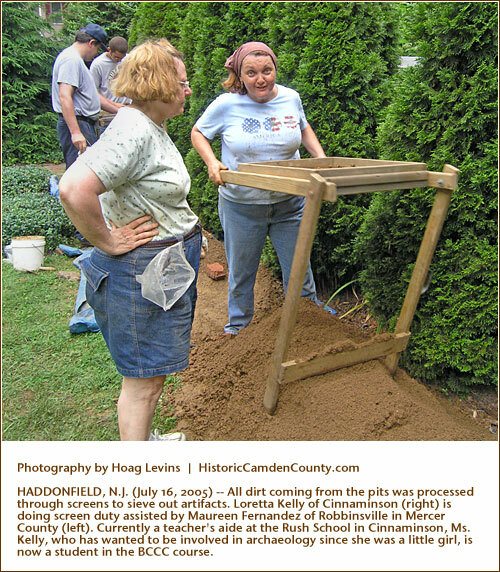 Above, left, Loretta Kelly of Cinnaminson is doing screen duty assisted by Maureen Fernandez of Robbinsville in Mercer County. 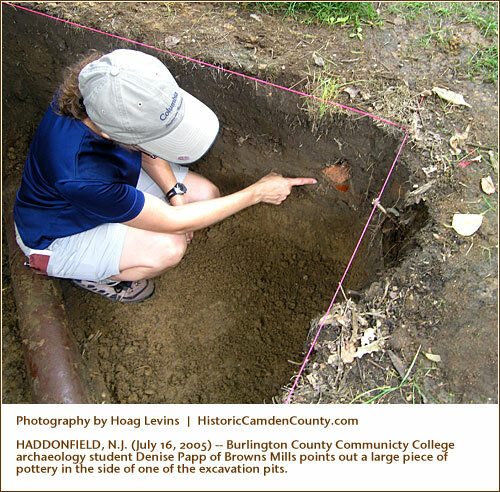 Currently a teacher's aide at the Rush School in Cinnaminson, Ms. Kelly, who has wanted to be involved in archaeology since she was a little girl, is now a student in the BCCC course. 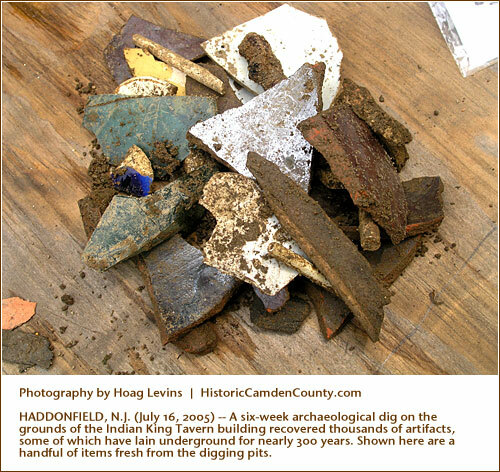 Above, right, is a raw pile of the dirt-encrusted artifacts that came out of the screens.
. About this Web site ..